Miao & WafuPafu Comic Blog » “Snack”, anyone? Yum..
What? 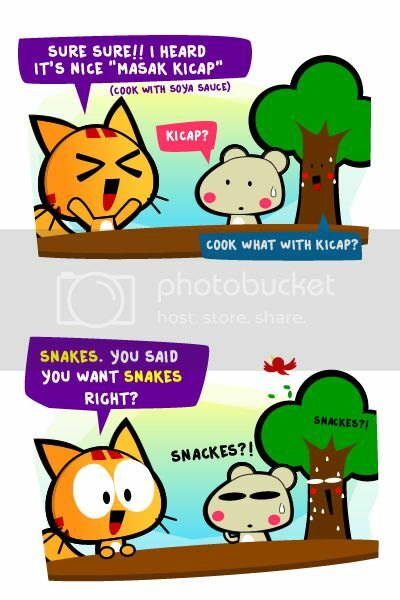 Snake and Snack does sound quite similar ler. And we do have snake meat here, RM30 per KG, tho I have not eaten before and it’s very rare too. It’s available only when they happened to encounter it in their farms or resident areas. I really misheard when I was hanging out with Maru and Rokku the other day in KL. They were so shocked. Hahah. By the way, how adventurous are you in food? What’s the most adventurous/exotic you have tried or going to try? Honestly, beside exotic food, we do have so called normal food and unique one too. hahah don’t be scared. You can check out this list I made. 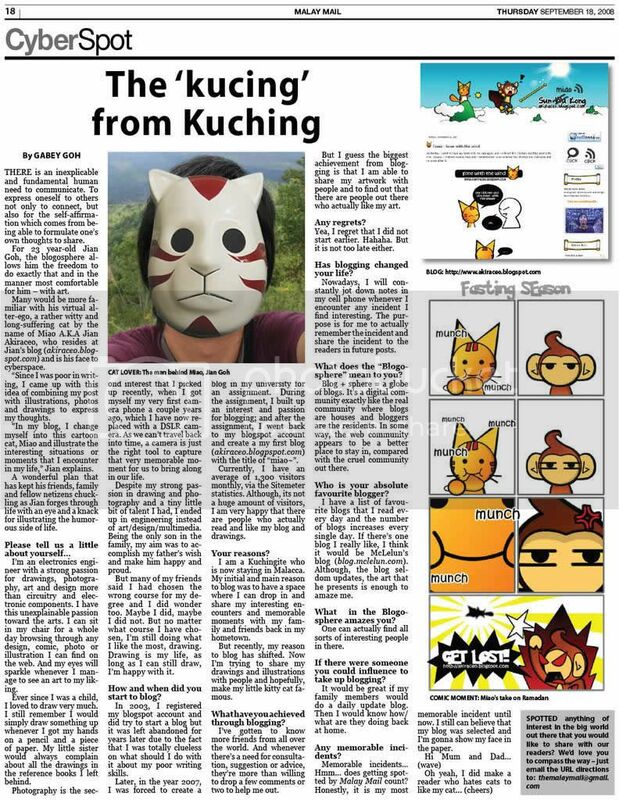 I think useful for anyone who is coming to Kuching. What’s so interesting about our food is it is totally different from those Peninsular. Now I wanna play a game… please click “read more” to start the game. Here’s a pic of snake meat cooked with herbs. You are trapped in a room for days without food and these are the two food offered. Posted on July 25, 2013 by Jian Akiraceo. 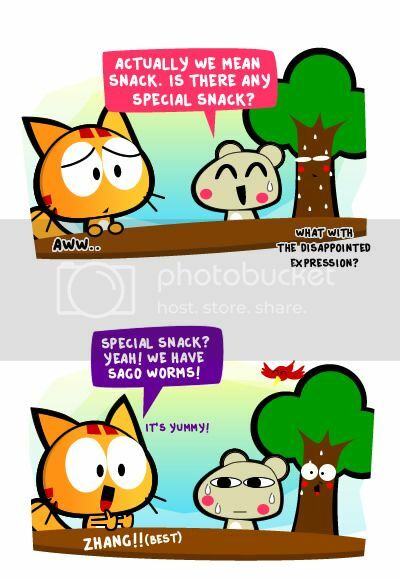 This entry was posted in Outdoor and tagged blog, cartoon, cat, comic, humor, sago worms, snack, snake meat. Bookmark the permalink. faster go try sago worm! later i gonna go hunt also. I want Sarawak Laksa and Kolok Mee when I’m there. No snake or worms, ok? Come here must try all food kan! how can!! Okay maybe not snake coz it’s expensive and rare. how do you define normal? But I definitely don’t want sago worms. Especially since they are eaten alive…so geli, they can move in your mouth! I’ve eaten snails (escargots) and sheep’s brain (haggis) before, so I think I can be considered quite adventurous. But I don’t want to eat bugs…somehow I associate them with dirtiness. no need to eat raw also can. it eats only sago and stays inside sago tree since small. what if snake taste weird, worm taste like very delicious thing u ever taste before.. which 1 you choose? No, never try and never thought to. 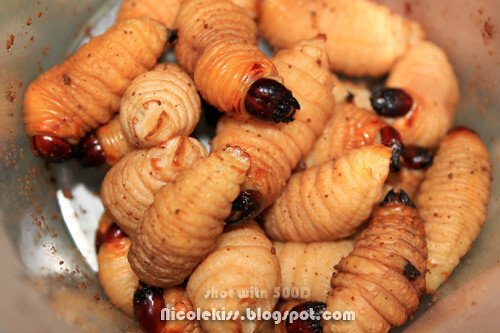 Fried sago worm is nice. Crispy on the outside, milky in the inside. Just chew on it’s body & avoid the head. *Warning: If you have high blood cholesterol, don’t dare more than 1. Not encourage to eat often. It’s actually found & sold here in Klang Valley. Heard, there are some local supplies from some local plantations. Never been to Sabah, never been overseas LOL. Would def. love to visit the place esp. to try the “fermented fish dishes” 🙂 & “only in Sabah/Sarawak” fruits. Tasted insects before, but don’t fancy it’s taste or smell. Those black ants are actually pretty dangerous esp. it’s head part which contains some toxin chemicals usually meant to numb it’s victim from it’s bite. but some very unique in texture. woah.. i heard those white/green ants taste nice like butter. By the way, your pdf link – the file is corrupted/damaged. Sila load sekali lagi! I have eaten fried crickets and maggots in Thailand and ate ‘Balut’ in Philippines. Balut was actually nice except when you bite on the foetus. Bleargh! i posted the wrong picture. yea, i heard balut is nice too just that the feather and stuff. YERRR… why r u so obsessed with sago worms latelyyy!! never heard of that !! we have those in Kuching? ouuu.. i didn’t know that.